Teeth whitening is the most requested dental treatment today, but it’s expensive and time consuming for your dentist to carry out in-office. 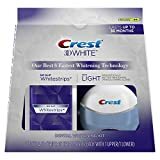 Crest 3D White Whitestrips With Light (view on Amazon) offer an affordable at-home solution, giving you results which last an astonishing 3 years. According to the ADA, the teeth whitening industry is growing fast. This is unsurprising, because we are hardwired to see a white smile as a sign of youth and good health. Teeth are naturally white – aging causes yellowing, and smoking or drinking tea, coffee or red wine causes staining. A great smile is also a sign of success and confidence, with over 70% of people believing that a winning smile can be a deciding factor in career advancement. Despite being the most requested dental treatment, teeth whitening is not without risk. So it’s important to devote time into making sure you get the safest and best result possible. And that’s what we’ve done for you in this Crest 3D White Whitestrips with Light review. 1.) Do Crest 3D White Whitestrips with Light work? 2.) Are Crest 3D White Whitestrips With Light Safe? Are Crest 3D White Whitestrips with Light worth it? Light technology breaks up stains, making the bleach work more effectively. Strong, so can cause sensitivity. Longer treatment time than regular strips – one hour for the strips plus 10 minutes for the light. Crest 3D White Whitestrips with Light are Crest’s most effective whitening product with long lasting results. Application is simple but does require an hour and 10 minutes a day (for 10 days). As with nearly all whitening strips, these whitestrips work using a type of enamel-safe bleach, called hydrogen peroxide. The hydrogen peroxide is delivered to the core of the tooth, and breaks down the colors within the tooth, bleaching away years of staining and discolouration. The difference with Crest 3D White Whitestrips with Light is they combine whitening strip technology with blue LED light technology to dramatically improve the effectiveness of the whitening strips. The combination of Crest’s specially engineered advanced blue light technology with the same whitening ingredient used by your dentist delivers faster results than using whitening strips alone. This is because the light weakens and breaks up yellow stains. This not only speeds up, but radically boosts the whitening power of the enamel-safe whitestrips. If you follow the instructions correctly, Crest 3D Whitestrips With Light can take the brilliance of your smile to a level that lasts for up to 3 years, after only 10 days of use. And at a fraction of the cost of professional in-office treatment. For added convenience, Advanced Seal technology holds the whitening strips securely in place, meaning you can move around talk and even drink water during application (view details). All Crest 3D White Whitestrips use hydrogen peroxide as the whitening agent. This is the same enamel-safe whitening agent is used by dentists worldwide. The stronger a whitening product, the higher the risk of tooth sensitivity is. Those with sensitive teeth are likely experience some irritation. However, this is usually temporary and using specialist toothpaste for sensitive teeth will reduce the irritation. Rest assured that even if you do experience sensitivity, the bleaching agent will not alter or damage your teeth when used as directed. If you do have very sensitive teeth you may wish to opt for Crest 3D Gentle Routine Whitestrips which are specially formulated to be gentle on teeth and gums. As always, consult your dentist before starting a new treatment. Crest 3D White Whitestrips with Light should be used daily for 10 days, not as one off treatments. Some users report noticeable results after the first application. Full results should be achieved after the 10 day period if you follow the instructions properly. And Crest offer a whiter smile or money back guarantee. Bear in mind that teeth whitening kits do not work in the same way for everyone. Yellow teeth typically respond well but gray teeth are very difficult to bleach and may require an alternative approach. Also, heavy smokers or tea drinkers might get different results from non-smokers who avoid tea and coffee. It’s also important to remember that whitening products only work for natural teeth. If you have crowns, caps, veneers or fillings, the color of these will not be altered. Using whitestrips with dental restorations may result in a color mismatch. Apply the gel side to your upper teeth, following the gumline. Press gently for good contact and fold the rest of the strip behind teeth. Repeat for lower teeth. After 60 minutes, turn on the light device and hold it against the top strip until the light automatically turns off. Then repeat the process for the bottom strip. This will take a total of no more than 10 minutes. The longevity of results depends on each individual person – diet and oral hygiene are contributing factors. Cigarettes, coffee and red wine are widely known to stain teeth. If you indulge in these frequently, results will not last the maximum amount of time. Otherwise, you can expect your results to last up to 36 months – the longest results available from a DIY product. intake during this time can significantly improve results. mouth with water immediately after to prevent stains from settling in. Great oral hygiene is critical to maintaining a beautiful smile. remove build up from those hard to reach areas. If you experience any sensitivity, use a specialist toothpaste like Sensodyne during the treatment period. For ultimate results, try waterflossing with the Waterpik Whitening Water flosser. It’s fun, effective, and helps to maintain a dazzling smile. maintain a white, bright and healthy smile all year round. If you want dazzling results that really last then this kit is a smart choice. Crest 3D White Whitestrips with Light are an affordable alternative to professional in-office whitening. This blue light system breaks down stains and maximises the whitening potential of the strips giving professional results. The light is lightweight, water resistant and easy and convenient to use. What will happen if I use the light longer than directed? With any whitening product, sensitivity and gum irritation is a possible side effect. As the light enhances the effects of the peroxide, using the light for longer than recommended can cause additional sensitivity and irritation. Always use a whitening product as directed by the manufacturer. Can you change the battery in the light? No – the battery is not replaceable. The device is designed to function only for the duration of one treatment (10 days). This means that once the light runs out of charge, you will need to purchase a new kit. Yes whitening strips do have an expiration date which can be found on the box. While the safety of the product isn’t compromised after this date, the effectiveness of the whitening agent may be reduced. Should I remove the whitestrips before using the light? No, the whitestrips should be left on while using the light. Can I use different whitestrips with the light? For the best and safest results, whitening products should only be used as directed by the manufacturer. Also, the light is only designed to last for one treatment period (10 days). Do Crest 3D whitestrips cover all of your teeth? No, Crest 3D Whitestrips are designed to treat only visible teeth. This means that they will extend to cover around 6-8 teeth on the top and around 6 teeth at the bottom. The whitestrips do fold around the back of the tooth, but only for security, and will not give full coverage behind the teeth. Crest recommend that this product is not used more than twice a year. This should be no issue, as whitening results last 36 months and beyond.